While the primary unemployment rate used by the Bureau of Labor Statistics (BLS), U-3, is a helpful indicator of improving or deteriorating economic conditions in the United States, it doesn’t tell us everything we need to know about the underlying health of the labor market. U-3 is too narrow of a measurement because it counts people as unemployed only if they have actively searched for a job within the past four weeks and are currently available to take a job. To get a broader view of the health of the labor market, we should consider an alternative metric of unemployment. 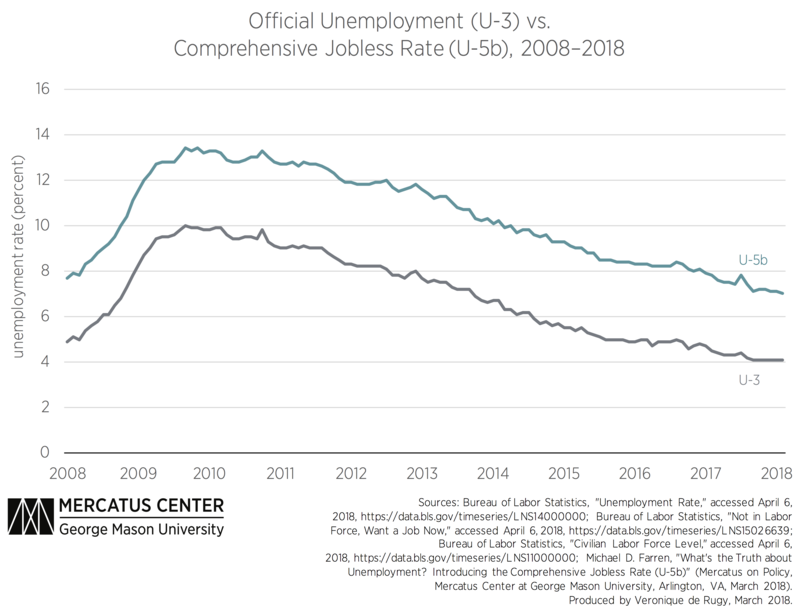 Recent research from the Mercatus Center at George Mason University introduces a more holistic measurement called the Comprehensive Jobless Rate, or U-5b. This metric includes everyone who wants a job and is capable of working. Unlike the BLS unemployment measurements, U-5b counts all people who say that they want a job, regardless of their current availability for work and regardless of the length of time since they actively looked for a job. This means that U-5b catches the people who want a job but fall through the cracks in the other unemployment measures. The latest Comprehensive Jobless Rate of 7.0 percent may not paint as rosy a picture as the official unemployment rate of 4.1 percent, but the continuing improvements in U-3 and U-5b are certainly a trend to be welcomed. Recent tax reform is likely boosting economic growth, which should continue to drive joblessness lower. However, policymakers should be wary of resting on their laurels. Instead, they should aim to sustain robust growth levels with further policy reform. State-level reforms that set an ambitious goal for the elimination of many occupational licenses and the reduction in requirements for those remaining licenses. Recent Mercatus research has illustrated how occupational licensing reduces opportunities for the most vulnerable workers who need jobs the most. State-level restrictions on municipal minimum wage increases, so that businesses operating at the margin of profitability can survive and continue to employ low-skilled workers. Revising government aid programs that reduce the potential workforce available to employers by discouraging those who can work from doing so. Mercatus research on declining labor force participation has found that as disability aid programs became more generous and accessible, their enrollment increased. This rising enrollment can explain a large part of the decline in labor force participation of prime-age men. Reforming tax laws to allow for a deduction of all forms of productivity-enhancing investments, especially to allow workers or employers to deduct the cost of training needed to perform a new job. This would motivate employers to invest in worker training, helping workers to retool their skills and close the skills gap. Enacting growth-enhancing immigration reform by expanding visa programs for both high- and low-skilled workers to meet the evolving demands of the US labor market. The resulting economic growth will create more job opportunities for Americans and immigrants alike. What’s the Truth about Unemployment?